I am loving Spring. This past week we have gone from having 80+ degree sunshiny weather to a mostly cloudy 70 degree day. It feels quite chilly out. Everywhere I look there is something beautiful to look at. My favorite peonies in my cottage garden are coming along nicely and will bloom in the next few weeks. Lottie was wandering around, too. We met up in the driveway. Tim is grinding stumps out in the pasture this morning. This area is going to be an arena for the girls to ride and train the horses. Lindsay will also use it for giving riding lessons. I am thankful for a husband who is able to do many things. I know our kids are too! I love the wild violets that grow in our yard. I know that many people will think I am nuts, but when you live in the country you can't keep out every weed from your yard. I love the way the violets look. Very sweet. Today we hit our official 180th day of required schooling. I have a love/hate relationship with this. Part of me loves it - "WooHoo! We're done!" But actually that is the reason I hate it as well! I don't want my kids to have the mindset of being 'done' learning. Actually, we have until June 30th to turn our evaluations into the school district. And our evaluations are going to be May 25th. That is a whole month away. In the meantime, we are going to continue to read, finish up some math, pull together our portfolios, print off our reading lists, decide which art projects we want to show our evaluator, etc. I do love being finished before our state homeschool convention, which is next month. That way I can focus on next year. Some years when we are not finished before the convention, I am so excited thinking about next year that I don't want to finish up what we are working on! I planted Ranunculus in my red pot for my porch to give a bit of color out front. I really like them. This is the lone yellow tulip that shows up every year! Lindsay transplanted Strawberries yesterday, from the front flower beds to one of our raised beds. We really need another one just for Strawberries. Our Italian parsley and cilantro...coming up from self seeding last year. Our creek has been flowing beautifully this year. While I mowed yesterday, the girls weeding all the flower beds, front and back and Tim brought home mulch. They spread the mulch while I made our dinner last night. These are some of the Strawberries that still need to be moved. The peonies are some of the most gorgeous I have ever seen. They get very large and smell like old fashioned roses. Can't wait until they bloom next month! I am sitting on my bed, cross legged, which is my normal way to sit on my bed. I have my computer propped on Tim's pillow and I am thinking of what it is I want to share with you. Spring is here in full force, but instead of beautiful weather we have had a lot of rain and chilly weather. We are due now for some days of 80 degree weather and more thunderstorms. However to think about the beauties of Spring, the dogwood trees are blooming, our Cleveland pear is is flowering, the tulips are pretty, and my lilacs are just about ready to burst out with blooms. The scent of lilacs is so lovely. I adore cutting them and bringing them into the house. 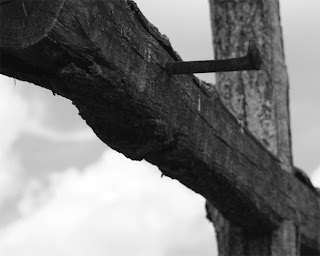 to focus on Easter, and it's deep importance in the life of a Believer in Christ. The photos are horrible but I wanted to show you my watercolors that I bought while visiting Williamsburg. These prints are very reasonably priced at about $15 and then I buy the frames at Williamsburg Pottery. It's a lovely way to add art to our home and to be able to view different buildings in one of my favorite historical places. This is a real watercolor painting that is of one of the taverns in Williamsburg. I found it at Goodwill last year for $6.95! I love it! Thanks for dropping by today - hope I don't scare any of you away with my terrible photos! Thanks Jewels and Melissa for your thoughts this morning! Sunny, nearly 70 degrees yesterday, we took ourselves to Longwood for the afternoon! Flowering trees are in bloom, so were many tulips, daffodils, violas and pansies. This little Miss, enjoyed the sunshine and being outside! The vegetable gardens are one of my favorite places at Longwood. I love the structures they use and the fact that they plant flowers among their veggies too! Kyle and Sarah ran through the paths reading the plant signs. Nate enjoyed going along with us yesterday, too.